“Cheers!” We gently clink our glasses together as rosy bubbles of Brut shimmer and dance. There are tasty, tasty things arrayed on the table under our upraised hands. The elegant tasting room’s cozy warmth, and our table’s own delightful offerings, make this the perfect haven from the cold winter air outside. We have been highly looking forward to this moment, and we mean to savor every second of it. The first sip is utterly delightful. The first nibble, divine. “Wow” - the murmur blends with the softest sigh of contentment. This is beyond our expectations, high enough as they were. What is “this”? 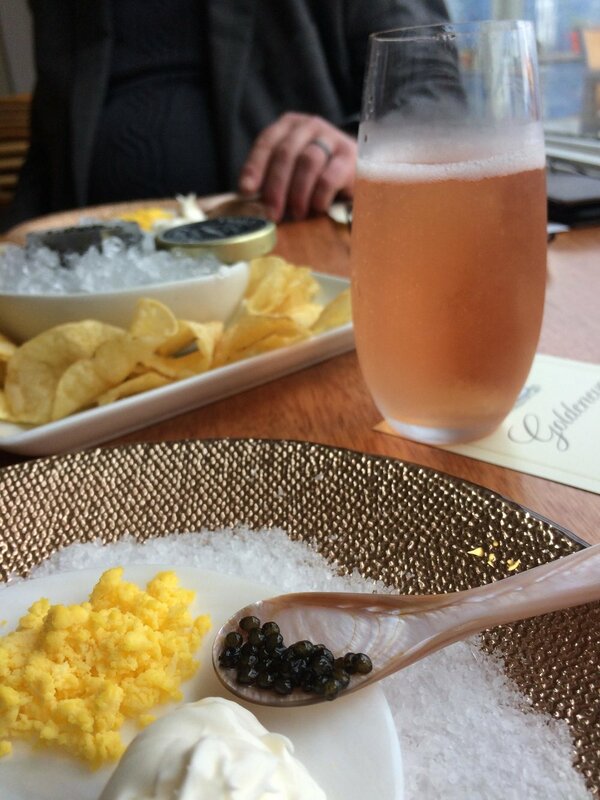 “This” is the recently created “Bubbles and Caviar” experience here at the Goldeneye Winery in the Anderson Valley. Paula, their Hospitality Manager, had been wanting to try something with this classic pairing pretty much since they first came out with their sparkling wine a couple of years ago, a delicate yet vibrant Brut Rose that has only gotten better with each successive vintage. Intent on perfecting the wine, the vintners have kept its production small, making only about 500 cases a year. The 2015, which is the year they currently have ready to enjoy, is perhaps their best yet. It’s graceful and bright, just a touch sweet, with a fun little tickle across the tongue that keeps you coming back for more. Knowing this delicious Brut called for a unique tasting experience to highlight its elegance, Paula finally pulled the trigger on her dream of combining sparkling wine and decadent caviar this past holiday season when she found Tsar Nicoulai Caviar. Tsar Nicoulai, based in Northern California, is the world’s pioneer of sustainably raised sturgeon, with a dedication to quality and care that shines bright in their farm-to-table products. 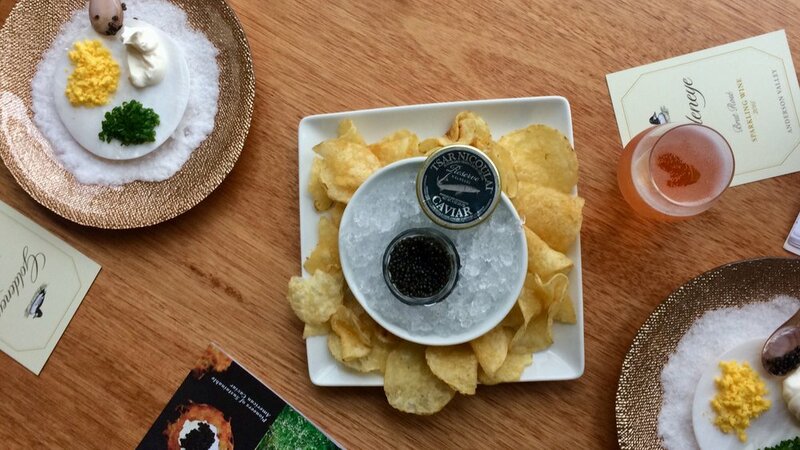 Paula selected their Reserve Caviar as the perfect pairing with Goldeneye’s new bubbles, and boy was she right. It’s creamy and smooth, with a slightly nutty savor and just the right level of saltiness – the word that comes to mind as we slowly savor each tiny spoonful is “luscious.” In fact, this caviar might just be our new definition of what lusciousness should be like. The presentation is lovely as well, with the caviar enthroned on a rose gold plate that both accents the colors of the caviar with its accoutrement and plays off the sparkling sheen of the wine in our glasses. It’s subtle, well-planned. Add to all this the friendly service and personal interest displayed by the various staff members, and this tasting experience has become, in our minds, one of the highlights of all that the Anderson Valley has to offer. Indeed, there is nothing else quite like it in the whole of Mendocino County as far as we have heard. As we assiduously finish off the last few beads of caviar and the final drops of sparkling wine, intent on not wasting even a single milligram of this goodness, we contemplate the next time we might be able to come back and indulge in this experience again. At which point our server Monica starts to tell us about the Estate Tasting they do that includes a cheese pairing with their most sought after Pinots and select accoutrements. PLUS this summer they will be running private ATV tours of their gorgeous property with tastings al fresco … Umm, can we do all three please?